Several times over the past few weeks I’ve heard from people who gave up on art early on because of criticism of their artistic efforts. That is so unfortunate. Especially when it’s a child who takes away the message that they are not as good as others are. Everyone is good at art! Children – really all of us – should be able to create for the sheer joy of creating. And while there may be a specific assignment or a desired outcome, every attempt is valid and worthwhile. We all need more praise in our lives. Some art instructors seem to have a narrow view of what art should be. Others are so focused on method, they lose sight of the delight of self-expression. I once heard of a drawing class where the entire first session was how to sharpen a pencil in a very exacting way. Learning new techniques is important, but I like to think it can still be enjoyable and inspiring. When I teach I like to wrap everyone in a warm, fuzzy blanket of positivity. My goal is to encourage students to feel good about themselves and the work they create. Drawing, like any worthwhile skill, takes practice. If it’s enjoyable, it’s easier to practice, and successful results come more quickly. Art is a wonderful therapy. Gaining the confidence to create a personal expression is both fulfilling and healing. 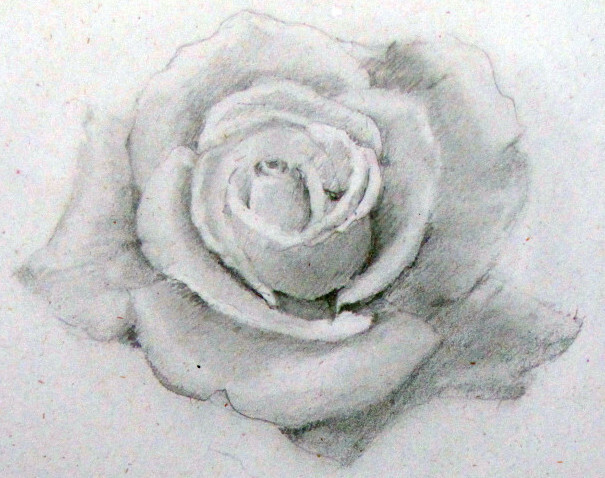 So give yourself a rose today for your efforts and keep on drawing!